Held is a German motorcycle clothing company. They are still family owned and they have earned a reputation for high quality products. Held got their start making gloves in 1946 and by 1979 they were focusing on items for motorcycling. Today they have a full line of riding apparel, but their claim to fame will always be their gloves. I measured my hand and it came up to about 8.5 inches. According to their size chart I needed a size 9. I placed my order and a few days later I received my gloves. The first thing I noticed coming out of the box is quality. Everything about the Held gloves seems to be well done and completed with attention to detail. The leather is top notch and the sizing was accurate. I have two complaints about the fit and feel of the gloves. The fingers are a bit too long for my hands and the thumb is very snug. That is the only down side to ordering gloves when you haven't tried them on. I decided to keep them based on their construction and features and I am glad I did. The Held Evo Thrux gloves are packed with technical features. These features do a great job of enhancing comfort and increasing the level of protection. The back of the hand is constructed of cowhide and the palm is made of kangaroo leather. Super Fabric – This fabric consists of a base fabric with tiny armor plates. Super Fabric is 5 times more abrasion resistant than leather and in the event of a crash it will promote sliding in an effort to minimize wrist injuries. You will find super fabric on the heel of the hand, the top of the ring and pinky fingers, and the outside of the wrist on the cuff of the glove. The Super Fabric on the cuff is also further reinforced by a hard plastic protector. Plastic Knuckle Protector – The knuckle protector is sewn into the glove. If have large knuckles, you may find gloves with a floating knuckle protector more comfortable. The knuckle protector also has some holes molded in for airflow. Kangaroo Palm – This is one of my favorite features of this glove. Kangaroo leather is more abrasion resistant that cow hide so the leather can be thinner and provide the same level of protection. Since the leather is thinner you get a great feel for the bars. In fact, it almost feels like you aren't wearing gloves once you get them broken in good. Kevlar – Held has incorporated another layer of protection by adding Kevlar to the back of the hand. Solid piece of leather on outside of hand – One of the areas of a glove most affected during a fall is the outside of the hand. Held has reinforced the side of the glove by using a solid panel of leather from the heel of the hand up to the pinky finger. They have also added an additional plastic protector near the knuckle of the pinky finger. The Held Evo Thrux gloves were comfortable straight out of the box, but after riding in them for a few minutes I noticed my thumb falling asleep. These gloves do require some time to get them broken in. After several days of riding the gloves fit very well and my thumb no longer falls asleep while wearing them. The kangaroo palms give you fantastic feedback from the bars and if the days are getting cool the grip heaters will work very well with these gloves. I have worn these gloves in temperatures ranging from 104F – 50F. The range of comfort for me is from 90F – 60F. They are not insulated and they do have some perforation so they are definitely not cold weather gloves. Even though there is perforation these gloves do not flow a lot of air so when it gets really hot I like to switch to a more ventilated pair of gloves. Stretch Panels – You will find leather stretch panels on the back of the hand, in the fingers, and on the thumb. The stretch panels make the glove easier to move in. Flat Seam Stitching – The fingers are sewn with external stitching and flat seam. This may make the glove not look as finished on the fingers, but it is a great feature for comfort. No seam will bother your fingers while wearing this glove. Precurve – These gloves are placed on a hot iron during manufacturing to give them a nice precurve in the fingers. This will make them more comfortable on the bars. Wrist Strap – The addition of the wrist strap will make sure the glove stays on your hand during a fall. Cuff Closure – The cuff closure is ample enough to allow every jacket I have tried underneath it. I have successfully used Alpinestars GP Pro Leather Jacket, Alpinestars Mesh Textile Jacket, and Aeromoto Sport Leather Jacket. You can also fit the cuff under your rain gear easily. Perforation – These gloves have holes for airflow on the back of the hand, in the knuckle protector, and in between the fingers. Visor Wipe – There is an integrated rubber visor wiper on the index finger of the left hand. I don’t use this feature much because I change gloves if I get caught in the rain, but the few times I have used the wiper it has been adequate. Don’t expect miracles out of it, but it’s better than just using your whole hand. These gloves are very nice, but I would like to see the perforation flow more air. I have the best luck cooling my hand by spreading my fingers, but you can't ride like that all the time. For me personally, I wish the fingers were a little bit shorter, but that could be a good thing to other riders. I would also like to see them make the glove touch screen compatible. The Held Evo Thrux gloves have performed very well every time I have used them. They are easy to get on and off and comfortable while riding. These gloves do take some time to break in, but afterwards they feel even better. These gloves feel very “high-end” and I feel like they are worth the extra coin it takes to get into a pair of Held gloves. 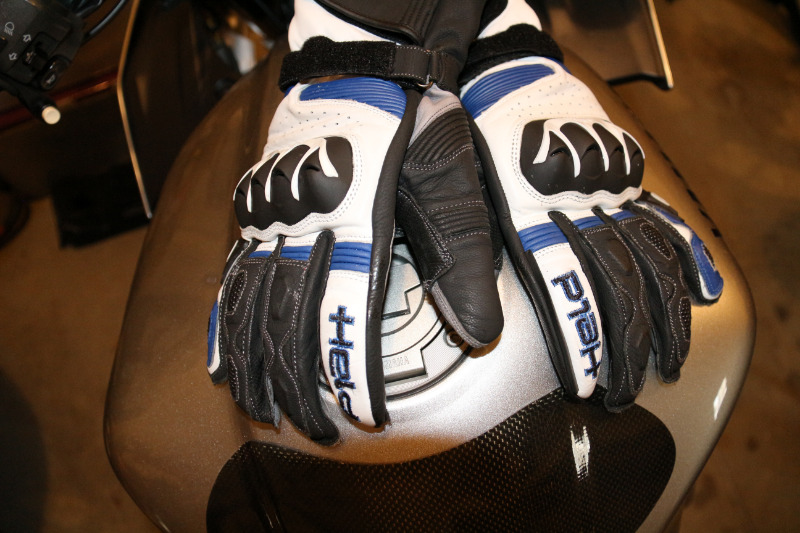 If you need a new pair of gloves for the street or track you can't go wrong with the Held Evo Thrux.